I am really trying to make my way through the pile of clothes I have set aside to refashion. This one took me ALL week to finish. Once I decided what I wanted to do with the skirt (which took the longest amount of time), it went pretty fast. I had to take out a couple of seams and redo them, but I am beginning to accept this as part of the process. I loved the fabric, but it was too big and not very flattering at all. I thought about keeping the gathered waist and just taking it in some on the sides. Then I looked at the skirts in my closet that I actually wear and realized I need to make it more fitted. 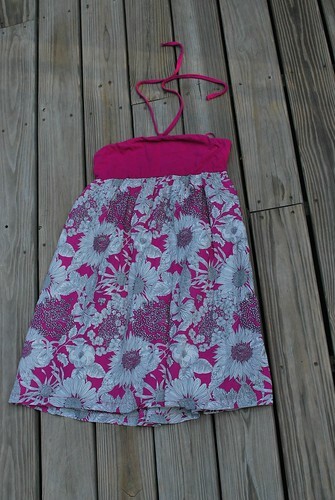 I used a skirt from my closet to make the pattern and even put in an invisible zipper. I also used the existing lining for the lining of the skirt. It is far from perfect, but at least it is wearable. AWE-SOME! I love it...how very cool are you? I have two shirts/skirts to refashion for the girls, I hope to get to before the shirts go out of style! I wish I could do this! Great job, I think it look fabulous on you and much prettier as a skirt. I'd say you did a darn good job! A very functional refashion, and you are looking hot, my friend! WOW! I think is so pretty. You make me want to start wearing skirts and dresses again. I haven't for 8 years. Great job! I wish I had more experience sewing/altering clothes. I have a ton of stuff I don't wear but can't bear to throw out!